What do we really know about soap? If you're using one of the standard commercially-made bars, you may not even be using soap at all. 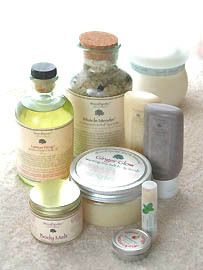 Walk into the beauty section of any department store today and you’ll find a dizzying array of soaps, for every possible purpose and in every conceivable size, shape, color, scent and style: Glycerine soaps, French milled soaps, triple milled soaps, handmade soaps, vegetable soaps, herbal soaps, mud soaps, milk soaps?whew! )...body bars, beauty bars, complexion soaps, spa soaps, exfoliating soaps and cellulite soaps…the choices are seemingly endless. It’s sometimes difficult not to feel overwhelmed. How does one choose? By the look of the pretty packaging, of course. Peering at the shelves looming above your head, you finally select a tantalizing “super duper triple milled milk soap?off the shelf and, entranced by the beautiful, soothing, natural color scheme and elegant wrapping, you read the ingredients label: ?span style="letter-spacing: 1">Sodium Cocoyl Isethionate, Stearic Acid, Coconut Acid, Sodium Tallowate, Sodium Isethionate, Water, Sodium Stearate, Cocomidopropyl betaine, Sodium Cocoate, Fragrance, Sodium Chloride, Propylene Glycol, Tetrasodium EDTA, Tetrasodium Etidronate, BHT, Blue 1, Red 33, Titanium Dioxide. ?First of all, you can’t pronounce most of the words, and secondly, where’s the milk? Shaking your head, you select a “Natural Glycerine Rosemary and Eucalyptus Herbal Exfoliating Soap? (which happens to cost twice as much as the previous one), and again you read the contents: ?span style="letter-spacing: 1">Sodium Palmate, Sodium Palm Kernelate, Water, Glycerine, Fragrance, Sodium Chloride, Oxidized High Density Polyethylene, Green #5, Tetrasodium EDTA, Titanium Dioxide, Yellow #10, Iron Oxide Black? Wait a minute. “Oxidized High Density Polyethylene? ?you say, “Hey, isn’t that the plastic that MILK JUGS are made from?? (Yep.) “And where the heck are the herbs in this so-called herbal soap? ?nbsp; You put the soap down and buy some nice dark chocolate instead, with a promise to yourself that you’ll bring a dictionary next time you fancy yourself a new bath product. Leaving the store, you have more questions than when you walked in. What do all of these unpronounceable ingredients mean? What’s a Cocoyl? What is soap, for that matter? And what’s the difference between a “French milled?soap and a “triple-milled? soap, or a “beauty bar?or a “body bar? Indeed. What IS the difference? The truth is, most of the products you see on grocery and cosmetics shelves are not actually soap at all—but rather detergents. And the products which are, in fact, true soaps, are generally very hard, shiny, molded bars laden with plasticizers, preservatives, perfumes and dyes. And here’s a secret: About 90% of these soaps you see on the shelves were probably made by the same three soap companies, and all share roughly the same base, with merely different additives. What has become known as “glycerine soaps?are some of the most misrepresented products of all, usually consisting of neither glycerine nor soap. These products are a far cry from the simple sudsy substance our grandmothers made. And there’s really nothing natural about most of them. But, it doesn’t have to be that way. So, how did something so basic as soap become so utterly complicated? Well, as usual, the answer begins with the bottom line. Soap, in its simplest form, is the result of a chemical reaction known as saponification, or, where an acid and a base together form a salt. All anyone needs to make soap is a fat (which may be animal or botanically derived) and an alkali, most commonly referred to as “lye? in the form of potassium or sodium hydroxide. When mixed together in a solution of water, the lye molecules collide with the fat molecules, splitting them apart, then neutralizing into two new molecules: soap and glycerin. Glycerin is a sticky, sweet substance that actually draws moisture from the air and conveys that moisture to the skin. This natural byproduct is the secret behind the finest handmade soaps today, making them ultra rich and superbly mild and moisturizing. It wasn’t until the industrial age when soapmaking corporations realized that the glycerin byproduct was more valuable than the actual soap—the old bottom line—and commercial soap, if it’s soap at all, has become what it is today. A few thousand years ago, or so the story goes, women washing clothes in a tributary of the Tiber river noticed that it was easier to clean clothes directly below Mount Sapo, where rain brought a mixture of clay, ash and fats from recent animal sacrifices and washed downhill into the water. It is for this place, Sapo, that soap and the process of soapmaking received its name: saponification. The truth is, no one actually knows who invented soap, or exactly when, but it is known that soap was used in some capacity dating back as early as 2800 B.C. Later, the Romans employed soap for washing textiles, and there was even a soap factory--complete with finished bars--unearthed from the volcanic ruins of Pompeii. But it wasn’t until much later that soap was used for personal hygiene, and even then, it seemed to be a trend which fell in and out of favor from one era or region to another over the course of time. During the Dark Ages, bathing and personal hygiene was associated with evildoing and, ironically, it was thought that sharing public baths contributed to plague and disease. Of course, once the connection between cleanliness and health was made, bathing again became acceptable and even encouraged. In the 8th century, A.D., soapmaking had been revived around Italy and Spain, where olive oil was abundant and was used to make a soap of superior quality and mildness. This olive oil soap became known as “castile soap? named for the region of Castile, Spain, in which it originated. By the 14th century, soapmaking was a common craft in France and across England, and eventually in the 1600s, soap had traveled with settlers to the New World. But soap was not to last. During World War II, when a shortage of raw materials due to war-diverted resources made soap more expensive and impractical to make, an alternative was found. Detergents had been used in Germany since around 1916, made from petroleum byproducts and superior to soap in its ability to scour nearly any surface while rinsing clean, with the added benefit of being much cheaper to produce. This indiscriminate cleansing power came at a price; detergents clean a little too well, and tend to strip everything away from the hair and skin, including the beneficial natural oils, and leaving a feeling of dryness or chapping. During the boom of the 1950s, though, detergents had already superceded soap and became the new standard of cleaning. Today, detergents are the indispensable product; used in everything from toothpaste to laundry liquids and powders to shampoos to car polishes to shower gels and “body bars? And detergents continue to strip our skin and hair and continue to come at a price; the mounting problem of dwindling petroleum reserves, a non-renewable and highly polluting resource. Today, products litter the shelves of supermarkets and beauty departments which look a lot like soap, but aren’t. Mostly, they are detergents and can be most easily identified by the label, which will say, “beauty bar?or “body bar? rather than “soap? If you’re looking for a true soap, it does still exist, but usually in a distorted and chemically-altered, inferior, probably-drying bar. True soap is defined as a salt as formed by the reaction between an oil or fat and an alkali—that same old ancient process. But modern commercial soap is processed at high temperatures in a vacuum, which speeds up saponification for faster product turnover. Ever wonder why it is that commercial soaps tend to feel drying to the skin? Well, it all comes down to magical glycerin again—that beautiful natural byproduct of the soapmaking process. Glycerin is so valuable in other cosmetic and even food applications that soap companies realized that they could make more money off the byproduct of soap than the soap itself. Without the glycerin, commercial soap is very drying. In order to make up for it, and to make a longer lasting product, freshly cooked soap is extruded between chilled steel rollers, then shredded and chipped, amended with plasticizers to make it shiny and hard, then mixed with perfumes and dyes to make it look and smell pretty, along with preservatives so it has an infinite shelf life, then pressed back together under tremendous pressure, compacted into moulds, packaged and sold. This is what is known as “milled soap? But it doesn’t have to be that way. Soap doesn’t have to be drying. It doesn’t have to be made from animals. It doesn’t even have to be made with heat. In contrast, soap can be luxurious, gentle, vegetable-derived and natural. Using modern precision and finer formulations of quality oils, and by retaining the natural glycerin, soap can be made by the old fashioned method (known as the “cold process?, which yields a rich, creamy, moisturizing and abundant lather, without drying the skin or polluting the planet. Cold process soaps are usually made in small, artisinal batches by hand, with high-quality nut or fruit oils chosen for their specific properties in finished soap. Olive oil is still considered the finest soaping oil, because of its unique ability to make both a hard and creamy soap, which moisturizes the skin without clogging the pores. Another important soaping ingredient is coconut oil, which contributes a quick, copious and fluffy lather. Other exotic oils and fats are often added to the soap formula, in what is called “superfatting”—a method of adding an extra percentage of nourishing oils to the forming soap, which will remain in their unreacted form and thereby lend extra emollience within the finished bar. Look for high quality ingredients in a soap, handmade or otherwise. Unfortunately, just because it says “handmade? doesn’t necessarily mean that it is of high quality. Usually, you get what you pay for in handmade soaps. If you want to avoid synthetics, you’ll want to look for soaps made with pure essential oils (as opposed to fragrance oils), certified organic cold-pressed oils and herbs, and botanically-derived colors in muted earth tones. Read your labels. If you can’t pronounce (or even recognize) most of the words on the ingredients list, it’s probably not natural. You shouldn’t need a dictionary in order to choose a soap. And remember, if a “shea butter soap?doesn’t have shea butter in one of the first five ingredients, there’s probably not much shea butter in it. Incidentally, when you read the ingredients of a commercial soap, you will quite often see “sodium tallowate? listed. Sodium tallowate is rendered animal fat. Tallow is still used because it is cheap, and because it is abundant. If you want to avoid animal-derived products, you will want to make sure that the soap you choose does not contain sodium tallowate. Look instead for sodium palmate (palm oil, saponified) and/or sodium cocoate (coconut oil, saponified), if you choose a commercial soap at all. 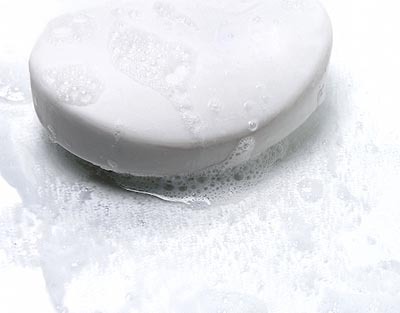 Most “soaps?sold in grocery stores are usually not soap at all—they are detergents! Detergents are cheaply produced petroleum-derived surfactants used in common household cleaning products like laundry liquid, car wash and dishwashing liquids. Yes, the same ingredient used to wash grime off your car is also in skincare products known as “beauty bars? “facial cleansers?or “shower gels? Real soap is made from animal or vegetable fats (we only use vegetable ingredients), mixed with an alkali (lye, or sodium hydroxide). The fatty acid molecules of the oils link up with the base, creating a new molecule consisting of soap and glycerin. There is no lye left in finished soap, because it is irreversibly, molecularly transformed. This process of making soap is called saponification. Handmade soap is fashioned in a time-honored tradition called the “cold kettle method? The soap isn’t really cold when it’s made, but the term refers to the absence of externally applied heat to drive the soapmaking process…except for the heat used to melt any butters or saturated fats, there is no other “cooking?involved. Saponification actually generates its own heat (exothermic reaction), which is just enough to drive the process to completion. This method of low-temperature soapmaking helps to preserve the nutrients imparted by the base oils and herbs, so they are still available to your skin within the finished soap. In contrast, commercial soap is cooked in huge vats, within a vacuum, which speeds saponification for faster product turnover. It takes a full month to make a bar of good handmade soap! Once the soap is removed from the mould and cut into logs or bars, it is placed on racks to “cure?for at least four weeks. Like fine wine or cheese, the aging process allows the soap to mellow and cure, so that it will last longer and lather better. Glycerin is a natural byproduct of the soapmaking process; handmade soaps retain the natural glycerin, which makes a gentle, creamy, moisturizing lather. Commercial soap companies remove the glycerin from their soap, then bottle and sell it for use in cosmetic and industrial products—for more than they make from selling soap! Removing the glycerin is why most commercial soaps leave skin feeling dry and itchy. “Glycerine soap?is generally not soap at all—just like other commercial “soaps? it is usually made from detergents. Even in the rare occasion it is from a true soap base, it must be processed at very high temperatures with special chemicals in order to achieve the characteristic transparency. To “superfat?a handmade soap means that there is a calculated excess percentage of a particular emollient oil (such as Shea Butter or Avocado Oil) which, instead of being linked up with lye and turning into soap, will remain in its original state within the finished soap and will be made readily available to the skin. The practice of superfatting is the ultimate luxury in a moisturizing soap. “Castile Soap?is the common name for a soap made entirely from olive oil, and named for the region of Spain from which this type of soapmaking originated—the province of Castile. Today, the term is sometimes used to describe any soap made with olive oil, regardless of its actual content. But for soap connoisseurs, a true castile is the gentlest of all soaps and can be made only from 100% pure olive oil. Until the mid-19th century, soap was usually made by women in the home from leached woodash and leftover tallow (boiled animal fat). Soap was made once a year and was generally used not for bathing, but for household cleaning and laundry. It was not until regular bathing came into vogue that soap was elevated to its modern use as a luxury “toiletry?item, and so the trend to perfume, color and otherwise decorate soap began.